Kents Cavern is one of those places that makes you feel like a minuscule dot on the Earth’s timeline. It’s been around longer than Stonehenge, the Roman Baths in Bath and the Cerne Giant. Yet, for somewhere so full of history and insight into the way our ancestors lived, it almost feels overlooked. We’ve been meaning to visit Britain’s oldest ancient monument in our home county of Devon for a while and finally found the opportunity while on our summer staycation. Kents Cavern was formed 2.5 million years ago and was first inhabited by early man in the Lower Palaeolithic to the Post-Prehistoric period. That’s 500,000 years ago to you and me. But it wasn’t just Neanderthals and then later Homo Sapiens who lived in the maze of natural tunnels. Remains of animals such as bears, wolves and sabre-toothed cats have been found in the cavern. It’s known that the Romans explored the caves centuries ago because of the evidence they left behind of their visits. But it wasn’t until the 19th Century that recorded excavations began under the guidance of Father John MacEnery and then William Pengelly. They uncovered ancient artefacts, human and animal remains that rewrote history and set Kents Cavern apart as one of Europe’s most important prehistoric sites. The oldest known evidence of modern humans in north west Europe – a 41,000 year old fragment of jaw bone – was uncovered here in 1927. 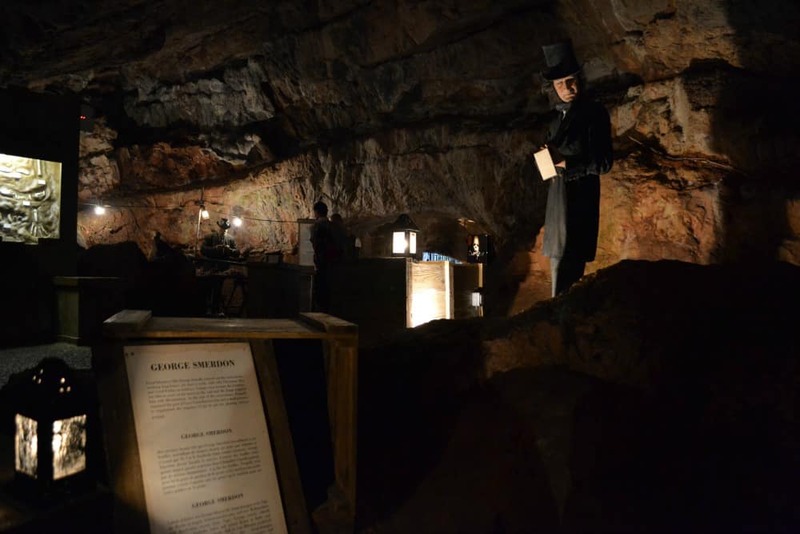 It was a typical UK summers day – cold and damp – so a trip to the Cavern seemed like the ideal way to entertain our family group, which included Tin Box Grandma and Grandpa who were holidaying with us. Before children, Mr Tin Box and I made a habit of visiting a cave or mine during our holidays. It became a bit of a tradition. However, since Tin Box Tot and Baby arrived, it’s not something we’ve attempted. With two extra pairs of hands along to help, we thought now was the time to see how our two toddlers would cope. We arrived at Kents Cavern just before lunch, so decided to have something to eat before venturing underground. When you arrive at reception you are given a time to meet at the cavern entrance for your tour. In August guides were taking in a new group of 20 people every 15 minutes. We were able to choose a later tour, giving us enough time to have lunch in the attraction’s cafe. Our tour began in the Vestibule where there is a short light and audio show that sets the scene for your visit. Three-year-old Tin Box Tot wasn’t a fan and asked to leave several times. Just before I began to feel like a really, really bad mum, the lights stopped flashing and our guide began to lead us through The Long Arcade – a canyon carved through the rock. Our guide switched on lights in each part of the cavern as we walked though so, apart from in The Bears Den where its customary for all the lights to go off for a short period of time, we could appreciate the natural beauty of the place. It didn’t take long for Tin Box Tot to start focussing more on the strange and mystical shapes created by the jagged stone walls rather than the scariness of the dark, narrow passages. She particularly liked looking at the stalagmites and stalactites that had survived some of the more explosive Victorian methods of excavation. 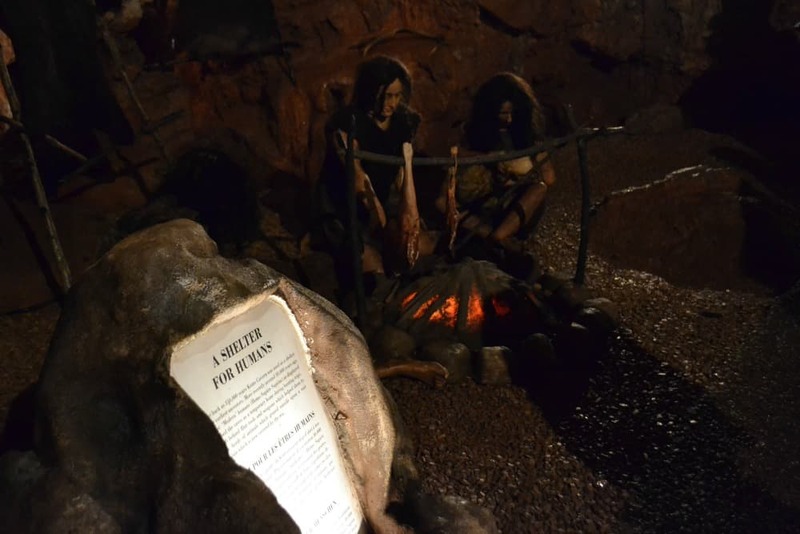 Kents Cavern is such an interesting place and very different from other caves we’ve visited because of the depth of information that is known about the inhabitants – animals and humans. If you love history, you’ll find the stories of the artefacts found in Kents Cavern, and how they were discovered, fascinating. There’s a free children’s activity sheet to complete around the caves, as well as a fun dig, cave painting and woodland trail to entertain children outside. There are a few steps inside the cavern, otherwise the whole walk can be done with a narrow pushchair. Wide pushchairs will struggle in some places and double buggies would not make it. On busy days a limited number of pushchairs are allowed in the cave at any one time. When you first enter the cavern the lights are switched off without warning. You might want to prepare children for this. Some young children may find the introductory light show a bit scary. If at any time you feel the need to leave the cavern during the tour your guide will arrange for you to be escorted out. You cannot leave the tour on your own. The temperature in the cavern is a constant 14°C (58°F) whatever the season. Dress appropriately and wear comfy shoes. 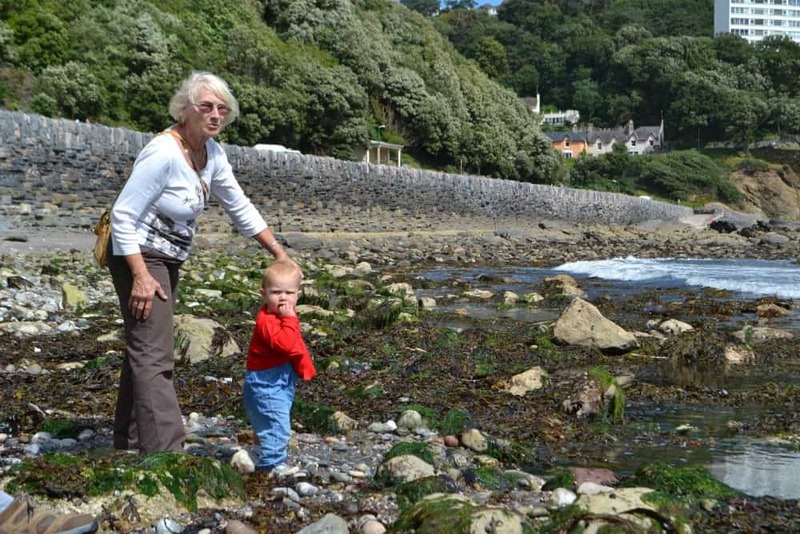 or take the kids to Paignton Geoplay park. 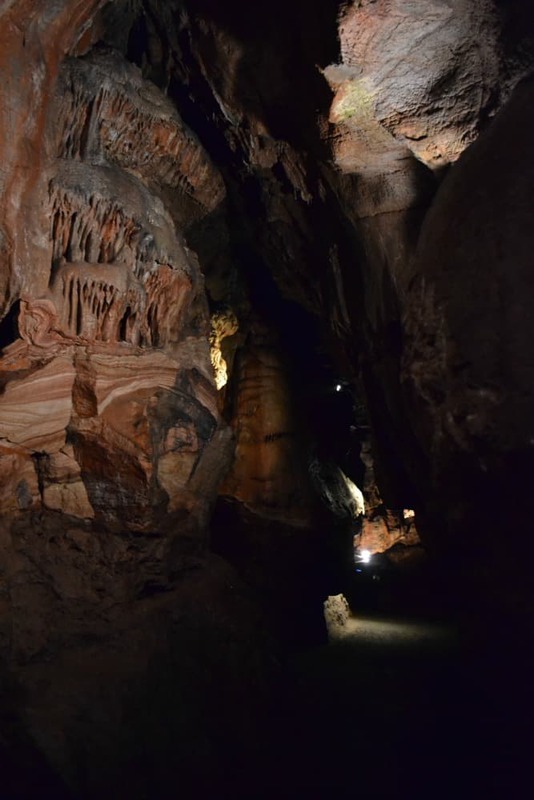 Are you a fan of visiting caves? Can you recommend any we should plan our next holiday around? Kents Cavern has always sounded fascinating but it’s somewhere I haven’t visited either (yet) – great to read how your girls handled it. This place looks amazing! I’d never heard of it, but I really want to go now! It sounds incredible. I must admit that whilst the history really appeals to me, I do struggle a bit with caves and caverns – I have to really concentrate on not letting claustrophobia get the better of me! I know what you mean Colette. There wasn’t too much ducking and diving in this one but I don’t think you would have liked the part when they turn out the lights. Everything suddenly feels a bit close. Oh, I love cave tours and made all the girls do one last year. Not sure they were as in to it as I was, but it’s certainly an experience for them! We will check this one out next time we’re in Devon. I’ve never heard of this place – isn’t it a shame they don’t make more of it, especially when the place is so old and has so much history. I shall look it up whenever we are that way again. My favourites are Wookey Hole and Cheddar Gorge. I really enjoyed Cheddar Gorge when I went before kids but I’m pretty sure I haven’t been to Wookey Hole. I’ve driven past a couple of times recently and you’ve reminded me that I need to add Somerset to our bucket list for next year! We did a similar tour in a slate mine in Snowdonia this summer and Lily was terrified! They are really eerie aren’t they! Sounds great I hadn’t heard of here but will remember it for next time we head that way. 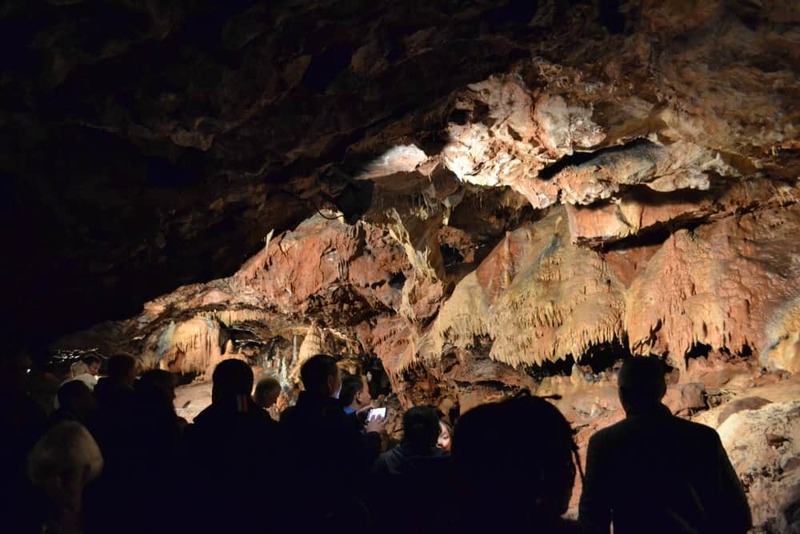 Kents Cavern tells us so much of ancient people and animals, so rich, that the cave tour is really fascinating. One of the oldest civilization in Europe in Kents Cavern that is something a very interesting reason for one to visit this cave when we come to Britain. Nice pictures taken. 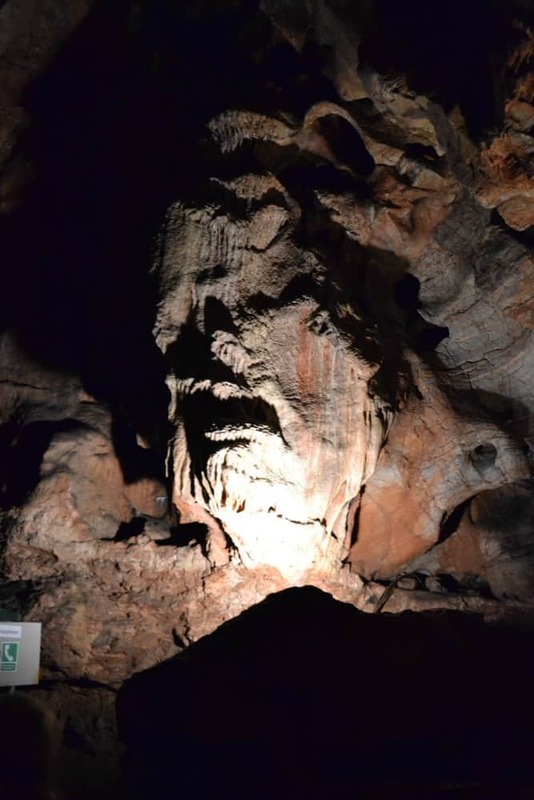 Hi, really enjoyed reading and have shared on my website, check it out if you like: http://www.thetravelblogs.com/exploring-caves-kents-cavern. I remember visiting when I was really young and getting petrified when they turned the lights off. The fact that I was stood in front of a rather large person wearing a faux fur vest and another man with breathing problems didn’t help me … I was sure I was about to be eaten by a bear!! Great memories and a fun day out for sure! Keep up the great work and happy travels! Hi Matt, thanks for sharing this on your site. I’m glad you enjoyed it and that it brought back great memories!